Patriotic People CARE: Your Paticipation is required, if you want Peace and Justice! Your Paticipation is required, if you want Peace and Justice! and BTW while we are at it:) IMPEACH Them All! "Each and every one of us must do all that we can ...: Peace/Impeachment demonstration in Washington, DC on September 15, 2007, backed by more than a million votes for impeachment, and accelerating. The rally will begin at 12 noon at the White House, followed by a march to the Capitol. 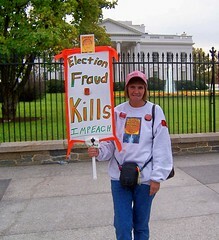 major Peace and Impeachment rally on September 15, 2007 in Washington. We intend to reach the first Million by then." Jaci, I remember you from OLS. What do you know about local September 15th rallies for those of us that can't make it to D.C.?